Big Apple Academy’s Social Studies academic program provides a broad spectrum of fundamental skills that foster students’ intellectual curiosity and lay a solid foundation for advanced studies in the Upper School. Our curriculum draws on both, traditional and progressive teaching methods, so that we may best provide for the success of each student. We strongly believe that our Social Studies program has all the necessary components for an effective learning process. Our teachers have an access to a variety of educational and interactive websites that enable students to analyze different examples of primary and secondary historical sources, conduct meaningful individual researches, and utilize ample opportunities to master their skills. Keeping in mind our students’ diversity of learning styles, our teachers widely implement educational technology, visual components, media resources, and Smart Boards to meet unique needs of visual learners. All these contribute to the idea that even complicated concepts of History and Geography can be though on a level accessible to young learners regardless of their academic abilities. Highly qualified team of Social Studies teachers utilizes a broad spectrum of instructional strategies and educational resources to prepare students to all required city and state examinations at different grade levels. In addition, our eight graders are given the opportunity to take U.S. History and Government Regent Course which is usually offered to students only in high school. We are always eager to win! We use a variety of conservative and innovative methods to increase our students’ academic motivation and ensure their intellectual growth. 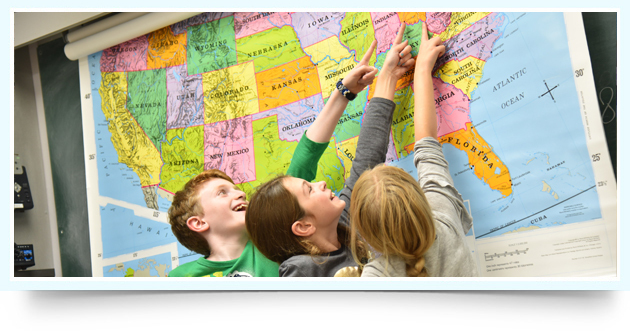 Big Apple Academy is an annual participant in National Social Studies League, a nationwide contest for public and non public schools that generates students’ participation and excitement. We can proudly state that in 2009, 2010, and 2011 Big Apple Academy proved to be one of the leading schools in the Nation. We all know that “becoming Number One is easier than remaining Number One”. That is why our students continue to build up knowledge and skills in History, Geography, and Civics to lay a solid foundation for future academic success.